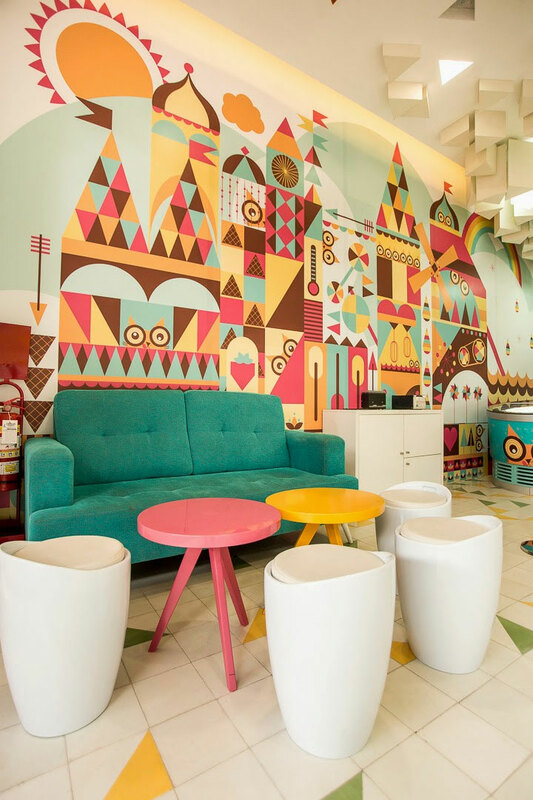 There is nothing more fitting for an ice cream shop interior design than to play on the idea of coldness. 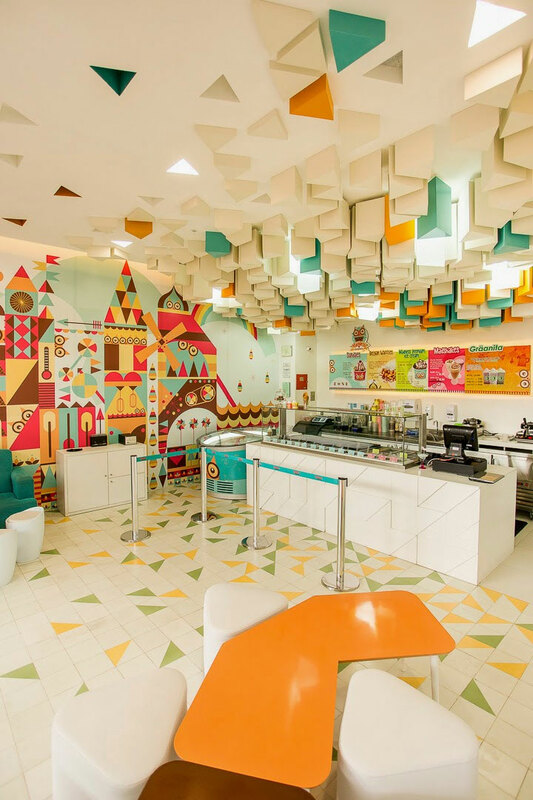 It is what id 12 ° 77 °, a Lima-based architecture and design firm, did with Madness Creamery, an ice cream parlor in the Peruvian city of Arequipa. 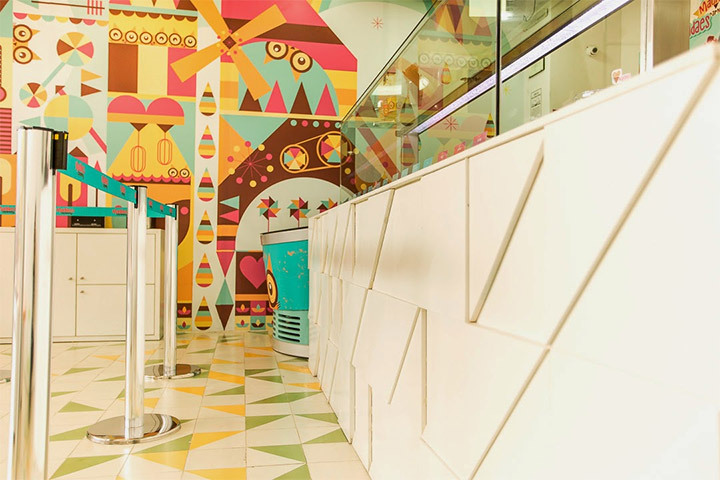 Inspired by the ice component of the delicious treat, and by its colors and aromas, the designers created a unique interior that uses tridimensional elements and bright colors to evoke the mouth-watering frozen desserts. Starting (unsurprisingly) with a white background that announces the cold presence of ice, the designers took the idea a step further and added white MDF triangular prisms to the ceiling, in an attempt to recreate the look of stalactites. The geometry of the arrangement is slightly irregular, with shorter and longer elements suggesting a natural formation. 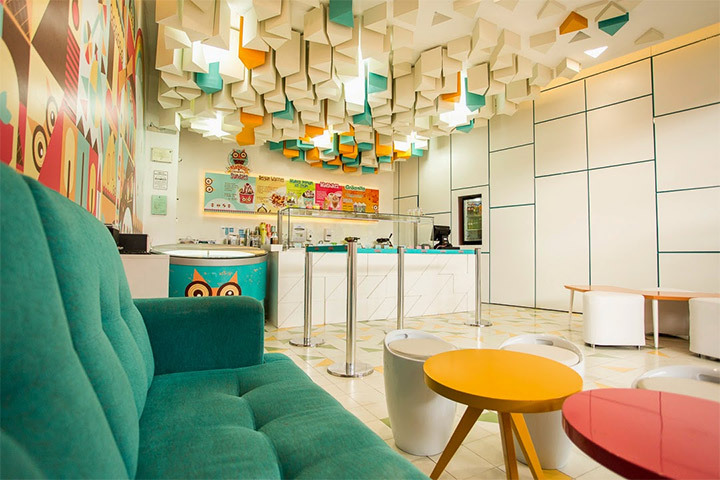 However, there are a few colored “stalactites” that give this ceiling architecture more contour by contrast and that achieve the additional goal of including visual elements from the corporate logo into the design. The designers borrowed the triangle detail from the corporate logo and used it all over the place. First, in the construction of the counter, where white quartz triangles arranged into a high-and-low design suggest the look of an ice sculpture. Second, in the ceramic mosaic of the floor where triangular pieces in corporate colors mirror the elements of the ceiling. 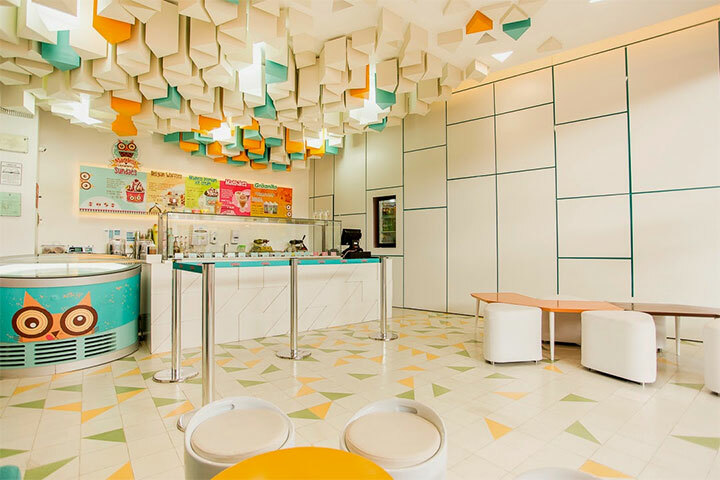 However, even though this ice cream shop design is centered around the concept of ice, the space is far from being cold or uninviting. On the contrary, the smart use of color makes the place appear fresh, playful and charming. The wall graphics, while keeping with a simple geometry, is imaginative, rich and bold, while the upholstered furniture balances the hard surfaces with its soft and inviting texture. 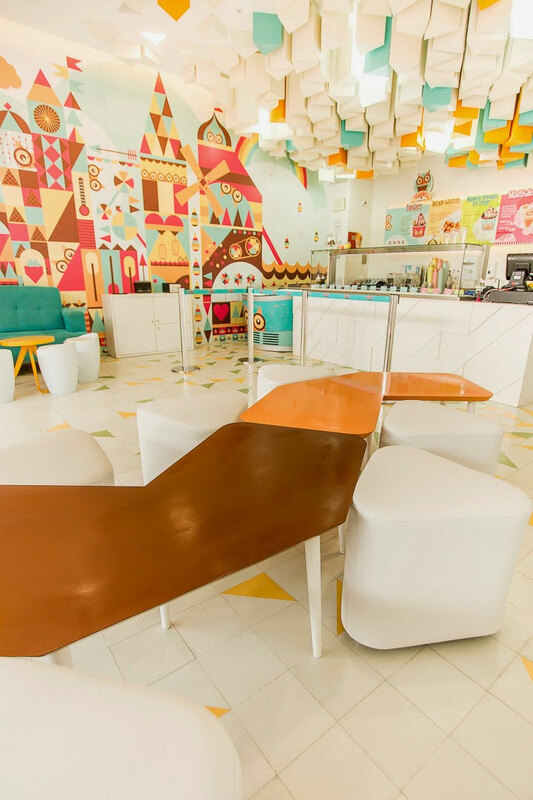 The furniture repeats the same pattern found in the rest of the ice cream shop interior design: a mixture of cold tones with appetizing hues that call to mind the flavors of ice cream. While the stools go back to the concept of ice for inspiration, the bold colors of the tables make them stand out and define the different seating areas. In this sea of cold and sweetness so well suggested visually, well-placed lights slip their reflections through the ceiling stalactites, send them glittering all around the store and add the final touch to an inspired interior. Please take a look at our Before and After images of selected projects from 2018 HERE.